SmartJobBoard is thrilled to announce the release of the new Android Application and iPhone Application. From now on, SmartJobBoard mobile application is cross-platform and available for users of both systems. SmartJobBoard is working on the development of enhanced job board software platform. The company is on top of modern web technologies using the most advanced software development tools. Job board products and services of SmartJobBoard would fit equally well to any employment resource no matter of its size and target audience. 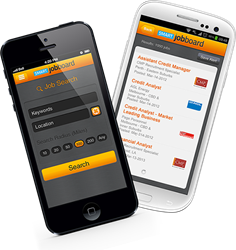 Today SmartJobBoard announces the release of the new Android Application and renewed iPhone Application. The applications provide job seekers with an innovative way to access a job board directly from Android and iPhone devices. There is no need to enter a site URL and account credentials each time to make a job search. With SmartJobBoard Android Application and iPhone Application, it takes only a few clicks to find a job and apply for it using user-friendly interface optimized for smartphone screen. “Today Android and iPhone devices are tremendously popular among job seekers. That is why it is important for us to provide up-to-date mobile solutions for job board owners. We consider the development of mobile solutions as one of our priority directions and hope that new Android and iPhone apps would add a significant value to job board business of our customers,” told Ben Akylbekov, SmartJobBoard Product Manager. Android Application and iPhone Application have a fancy design and a range of features vital for any job board. Job seekers can register on a job board via the application and search for jobs. They can apply for interesting jobs not leaving the application. Jobs can be viewed on map, saved for later review and emailed to friends. It is also possible to save a job alert and receive new jobs matching the search criteria by email regularly. Moreover, the applications include such Android and iPhone specific features; as searching jobs around the place, a user is currently located and saving employer contacts directly to contact list on Android and iPhone device. Android and iPhone Applications is an essential career tool for contemporary job seekers giving more and more preference to mobile recruitment. This is also a fresh update to the SmartJobBoard employment platform making it one of the most reliable and advanced job board software providers available. SmartJobBoard is an advanced software platform for creation of professional job board web sites. It includes everything needed for running, customizing and extending of online recruitment service. Whether a job board is niche or general, employer or job seeker oriented, paid or free SmartJobBoard allows implementing any ideas easily.